American computer scientist mission specialist astronaut 1994-2005. Grew up in Santa Clara, California. Status: Inactive; Active 1994-2005. Born: 1959-10-08. Spaceflights: 2 . Total time in space: 20.05 days. Birth Place: Hispanic. PERSONAL DATA: Born October 8, 1959, in Lima, Peru. Considers Santa Clara, California, to be his hometown. Married to the former Wendy L. Thatcher. They have five children. He enjoys flying, running, snow skiing, racquetball and spending time with his children. His parents, Rodolfo and Nora Noriega, reside in Gilbert, Arizona. Her parents, John and Elizabeth Thatcher, reside in Honolulu, Hawaii. EDUCATION: Graduated from Wilcox High School, Santa Clara, California, in 1977. Bachelor of Science degree in computer science from the University of Southern California, 1981. Master of Science degree in computer science and Master of Science degree in space systems operations from the Naval Postgraduate School, 1990. SPECIAL HONORS: Defense Superior Service Medal, two Defense Meritorious Service Medals, Air Medal with Combat Distinguishing Device, Air Medal (Strike Flight Award), Navy and Marine Corps Achievement Medal, two NASA Space Flight Medals and the NASA Exceptional Service Medal. EXPERIENCE: Noriega was a member of the Navy ROTC unit and received his commission in the United States Marine Corps at the University of Southern California in 1981. Following graduation from flight school, he flew CH-46 Sea Knight helicopters with HMM-165 from 1983 to 1985 at Marine Corps Air Station (MCAS) Kaneohe Bay, Hawaii. Noriega made two 6-month shipboard deployments in the West Pacific/Indian Ocean, including operations in support of the Multi-National Peacekeeping Force in Beirut, Lebanon. In 1986, he was transferred to MCAS Tustin, California, where he served as the aviation safety officer and instructor pilot with HMT-301. In 1988, Noriega was selected to attend the Naval Postgraduate School in Monterey, California. Upon graduation in September 1990, he was assigned to United States Space Command in Colorado Springs, Colorado. In addition to serving as a Space Surveillance Center Commander, he was responsible for several software development projects and was ultimately the command representative for the development and integration of the major space and missile warning computer system upgrades for Cheyenne Mountain Air Force Base. At the time of his selection, he was serving on the staff of the First Marine Aircraft Wing in Okinawa, Japan. Noriega retired from the Marine Corps in January 2003. He has logged approximately 3,000 flight hours in various fixed-wing and rotary-wing aircraft. NASA EXPERIENCE: Selected by NASA in December 1994, Noriega reported to the Johnson Space Center in March 1995. He completed a year of training and evaluation and was qualified for assignment as a mission specialist in May 1996. He held technical assignments in the Astronaut Office EVA/Robotics and Operations Planning Branches. Noriega flew on STS-84 in 1997 and STS-97 in 2000. He has logged more than 481 hours in space, including over 19 EVA hours in three spacewalks. Following STS 97, Noriega trained as the backup commander for the Sixth Expedition to the International Space Station and later as a member of the crew of STS-121. In July 2004, Noriega was replaced on the crew of STS-121 due to a temporary medical condition. 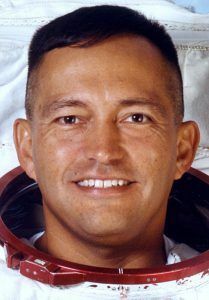 While awaiting future flight assignment, Noriega served as Chief of the Exploration Systems Engineering Division at Johnson Space Center. In January 2005, Noriega retired from the Astronaut Corps. He left NASA in August 2011. Noriega's final assignment was as the Director of Safety, Reliability and Quality Assurance for the Constellation Program at Johnson Space Center. SPACEFLIGHT EXPERIENCE:�STS-84 (May 15 to May 24, 1997) was NASA's sixth space shuttle mission to rendezvous and dock with the Russian Space Station, Mir. During this 9-day mission, the crew aboard Space Shuttle Atlantis conducted a number of secondary experiments and transferred nearly 4 tons of supplies and experiment equipment between Atlantis and the Mir station. During STS-84, Noriega logged a total of 221 hours and 20 minutes in space, traveling 3.6 million miles in 144 orbits of the Earth. STS-97 Endeavour (November 30 to December 11, 2000) was the fifth space shuttle mission dedicated to the assembly of the International Space Station. While docked to the station, the crew installed the first set of U.S. solar arrays and performed three spacewalks totaling 19 hours and 20 minutes in addition to delivering supplies and equipment to the station's first resident crew. The mission duration was 259 hours and 58 minutes, traveling 4.47 million miles. Born October 8, 1959, in Lima, Peru. Considers Santa Clara, California, to be his hometown. Married to the former Wendy L. Thatcher. They have five children. He enjoys flying, running, snow skiing, racquetball, and chasing after his small children. His parents, Rodolfo and Nora Noriega, reside in Gilbert, Arizona. Her parents, John and Elizabeth Thatcher, reside in Honolulu, Hawaii. Graduated from Wilcox High School, Santa Clara, California, in 1977. Bachelor of science degree in computer science from University of Southern California, 1981. Master of science degree in computer science from the Naval Postgraduate School, 1990. Master of science degree in space systems operations from the Naval Postgraduate School, 1990. Defense Meritorious Service Medal, Air Medal with Combat Distinguishing Device, Air Medal (Strike Flight Award), Navy Achievement Medal. Noriega was a member of the Navy ROTC unit and received his commission in the United States Marine Corps at the University of Southern California in 1981. Following graduation from flight school, he flew CH-46 Sea Knight helicopters with HMM-165 from 1983 to 1985 at Marine Corps Air Station (MCAS) Kaneohe Bay, Hawaii. Noriega made two 6-month shipboard deployments in the West Pacific/Indian Ocean including operations in support of the Multi-National Peacekeeping Force in Beirut, Lebanon. He completed his tour in Hawaii as the Base Operations Officer for Marine Air Base Squadron 24. In 1986 he was transferred to MCAS Tustin, California, where he served as the aviation safety officer and instructor pilot with HMT-301. In 1988, Noriega was selected to attend the Naval Postgraduate School in Monterey, California, where he earned two master of science degrees. Upon graduation in September 1990, he was assigned to United States Space Command in Colorado Springs, Colorado. In addition to serving as a Space Surveillance Center Commander, he was responsible for the acquisition of several software development projects and was ultimately the command representative for the development and integration of the major space and missile warning computer system upgrades for Cheyenne Mountain Air Force Base. At the time of his selection, he was serving on the staff of the 1st Marine Aircraft Wing in Okinawa, Japan. He has logged approximately 2,000 flight hours in various fixed wing and rotary wing aircraft. Selected by NASA in December 1994, Noriega reported to the Johnson Space Center in March 1995. He completed a year of training and evaluation, and was qualified for assignment as a mission specialist in May 1996. He has had technical assignments in the Astronaut Office EVA/Robotics and Operations Planning Branches. Most recently, he served as a mission specialist on STS-84 (May 15-24, 1997), NASA's sixth Shuttle mission to rendezvous and dock with the Russian Space Station Mir. During this 9-day mission the crew aboard Space Shuttle Atlantis also conducted a number of secondary experiments, and transferred nearly 4 tons of supplies and experiment equipment between Atlantis and the Mir station. During the STS-84 he logged a total of 221 hours and 20 minutes in space traveling 3.6 million miles in 144 orbits of the Earth. Major Noriega will serve on the crew of STS-97, the third Space Shuttle mission to carry hardware to space for the assembly of the International Space Station. He is scheduled to conduct 2 space walks on this mission. Launch is targeted for March 1999. Family: Astronaut. Country: Peru, USA. Spacecraft: ISS, Mir. Flights: STS-84, STS-84 Mir NASA-4, STS-97, STS-119A. Agency: USAF. Bibliography: 12, 5840. 2000 November 7 - . 2000 November 8 - . ISS Status Report: ISS 00-53 - . Nation: USA. Related Persons: Bloomfield, Garneau, Gidzenko, Jett, Noriega, Shepherd, Tanner. Program: ISS. Flight: Soyuz TM-31. 2000 November 30 - . STS-97 Mission Status Report #01 - . Nation: USA. Related Persons: Bloomfield, Garneau, Jett, Noriega, Tanner. Program: ISS. Flight: Soyuz TM-31. 2000 December 1 - . STS-97 Mission Status Report #03 - . Nation: USA. Related Persons: Bloomfield, Garneau, Gidzenko, Jett, Noriega, Shepherd, Tanner. Program: ISS. Flight: Soyuz TM-31, STS-97. 2000 December 2 - . STS-97 Mission Status Report #05 - . Nation: USA. Related Persons: Bloomfield, Garneau, Gidzenko, Jett, Noriega, Shepherd, Tanner. Program: ISS. Flight: Soyuz TM-31, STS-97. 2000 December 3 - . STS-97 Mission Status Report #06 - . Nation: USA. Related Persons: Bloomfield, Garneau, Gidzenko, Jett, Noriega, Shepherd, Tanner. Program: ISS. Flight: Soyuz TM-31, STS-97. STS-97 Mission Status Report #08 - . Nation: USA. Related Persons: Bloomfield, Garneau, Jett, Noriega, Tanner. Program: ISS. Flight: Soyuz TM-31, STS-97. 2000 December 4 - . 18:35 GMT - . EVA STS-97-1 - . Crew: Noriega, Tanner. EVA Duration: 0.32 days. Nation: USA. Related Persons: Noriega, Tanner. Program: ISS. Flight: STS-97. Spacecraft: ISS. The first STS-97 spacewalk began with airlock depress and hatch open at 1831 GMT on December 3. The suits went to battery power at 1835 GMT and Joe Tanner and Carlos Noriega left the airlock around 1845 GMT. Around 1932 GMT the RMS arm berthed P6 on the Z1 truss, and the astronauts manually latched it in place by 1940 GMT. There were some problems releasing latches on the solar array wings, but the first solar array began to deploy at 0123 GMT on December 4. This was the "starboard" (+X) array, wing SAW-2B. The port (-X) array, SAW-4B, was left undeployed. The astronauts closed the hatch at 0202 GMT on Dec 4 and repressurized at 0209 GMT. The P6 PVR radiator was deployed on the +Y side of the IEA at 0414 GMT on December 4. The SAW-4B wing was deployed starting at 0052 GMT on December 5. 2000 December 5 - . STS-97 Mission Status Report #11 - . Nation: USA. Related Persons: Bloomfield, Garneau, Gidzenko, Jett, Noriega, Shepherd, Tanner. Program: ISS. Flight: Soyuz TM-31, STS-97. 2000 December 5 - . 17:21 GMT - . EVA STS-97-2 - . Crew: Noriega, Tanner. EVA Duration: 0.28 days. Nation: USA. Related Persons: Noriega, Tanner. Program: ISS. Flight: STS-97. Spacecraft: ISS. The spacewalk began on December 5 with depress at 1718 GMT, hatch open around 1719 GMT and battery power at 1721 GMT. Repress was at 2358 GMT. The astronauts connected up P6 to the station, inspected the tension wires on wing 2B, and relocated the S-band antenna to the top of P6. They unlatched the aft TCS radiator, which was deployed sometime early on December 6. 2000 December 6 - . STS-97 Mission Status Report #12 - . Nation: USA. Related Persons: Bloomfield, Garneau, Gidzenko, Jett, Noriega, Shepherd, Tanner. Program: ISS. Flight: Soyuz TM-31, STS-97. STS-97 Mission Status Report #13 - . Nation: USA. Related Persons: Bloomfield, Garneau, Gidzenko, Jett, Noriega, Shepherd, Tanner. Program: ISS. Flight: Soyuz TM-31, STS-97. 2000 December 7 - . STS-97 Mission Status Report #15 - . Nation: USA. Related Persons: Bloomfield, Garneau, Gidzenko, Jett, Noriega, Shepherd, Tanner, Wolf. Program: ISS. Flight: Soyuz TM-31, STS-97. STS-97 Mission Status Report #14 - . Nation: USA. Related Persons: Bloomfield, Garneau, Gidzenko, Jett, Noriega, Shepherd, Tanner, Wolf. Program: ISS. Flight: Soyuz TM-31, STS-97. 2000 December 7 - . 16:13 GMT - . EVA STS-97-3 - . Crew: Noriega, Tanner. EVA Duration: 0.22 days. Nation: USA. Related Persons: Noriega, Tanner. Program: ISS. Flight: STS-97. Spacecraft: ISS. Astronauts Noriega and Tanner on December 7 performed EVA-3 to fix the tension in the SAW-2B solar array on the Station. Airlock depress was at 1609 GMT, hatch open at 1610 GMT and battery power at 1613 GMT. The astronauts left the airlock a few minutes later, probably about 1620 GMT. After fixing the solar array they installed the FPPU device to measure plasma conditions near the top of P6 and performed a few other minor tasks. They returned to the airlock at around 2110 GMT, closing the hatch at 2119 and repressurizing at 2122. 2000 December 8 - . 2000 December 10 - . STS-97 Mission Status Report #21 - . Nation: USA. Related Persons: Bloomfield, Garneau, Gidzenko, Jett, Noriega, Shepherd, Tanner. Program: ISS. Flight: Soyuz TM-31, STS-97. 2000 December 11 - . STS-97 Mission Status Report #23 - . Nation: USA. Related Persons: Bloomfield, Garneau, Gidzenko, Jett, Noriega, Shepherd, Tanner. Program: ISS. Flight: Soyuz TM-31, STS-97. Landing of STS-97 - . Return Crew: Bloomfield, Garneau, Jett, Noriega, Tanner. Nation: USA. Related Persons: Bloomfield, Garneau, Jett, Noriega, Tanner. Program: ISS. Flight: STS-97. STS-97 landed at 23:03 GMT. .